By Dr. Martin Luther. First published in 1566 in German, the “Table Talk” (as it is now more commonly known) is a collection of the towering Protestant Reformer’s informal, wide-ranging, often colorful and sometimes controversial conversations about topics ranging from Scripture to the sacraments, from the lives of the saints to the learning of scholastics, from civil magistrates to sacred music—and almost everything in-between. 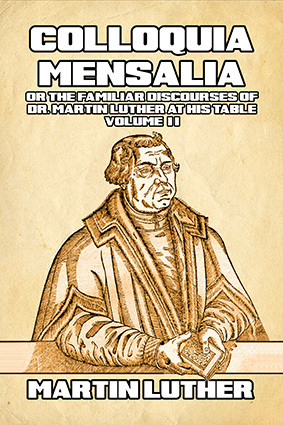 Luther’s “Table Talk” presents highlights from conversations (as the title page has it) “with divers Learned Men” on a wide range of theological, Scriptural, historical and social subjects; it also affords valuable and frequently eye-opening insights into “the opinions, motives, reading, daily life, and personal attitude of the greatest German of his age. No dry treatises these, the selections, arranged topically, are usually concise and straightforward, frequently marked by humorous anecdotes, sharp (and merciless) wit, and unrestrained zeal for the work of ecclesial reformation. Nearly all the copies of the original work were destroyed by order of Pope Gregory XIII (1572–1585), and possession of it was punishable by death. A single copy, wrapped in linen and coated in beeswax, had been secretly buried and was accidentally unearthed nearly 70 years after its banning. It was smuggled to England by Captain Henry Bell, who was responsible for its translation and first English publication in 1652. This new edition has been hand-proofed and completely reset to ensure that it contains none of the imperfections which mar either the original or reproduction versions.